A few years ago, Dave and I woke up on Saturday morning to take a drive to Calitzdorp. This is the home of South African Port and we really felt like tasting some. So, we found a Bed and Breakfast, made a reservation, found someone to feed the dogs and packed our overnight bags. We headed up the pass and after lunch wound our way to a town that was closed! Not one Port establishment was open, the main road was deserted and we decided to move along. I called Michelle to see where in the Garden Route they were staying, with the thought of spending a night with her and my step gran, to be told “we are about to enter a town called Calitzdorp”. They stopped, and we had tea and Dave and I went to spend the night along the coast. A few months ago, we decided to drive home from Wilderness via Calitzdorp and tasted some Port at 10am! It might have been a bit early, but at least we got to see the town when it was open. I came home with some pink Port and when I saw Woolworths had some pink grapes, I knew exactly what I wanted to do with the grapes and the Port. 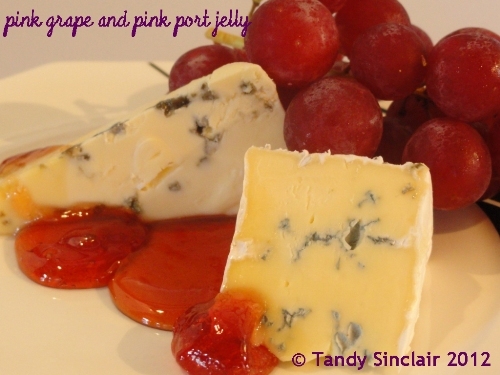 I thought a nice, soft jelly would be perfect, not only for some blue cheese, but for a dessert topping too. This looks so pretty and how fantastic with blue cheese. Don´t think I´ve ever heard of either pink port or pink grapes! Tandy this is just gorgeous and so beautifully photographed – although I could skip the blue cheese.